Each planner features the handy month-at-a-glance format with oodles of space to plan your busiest days. Extra pages are provided for notes. A planning tool with a 24-month window! Conveniently sized for a pocket or purse. 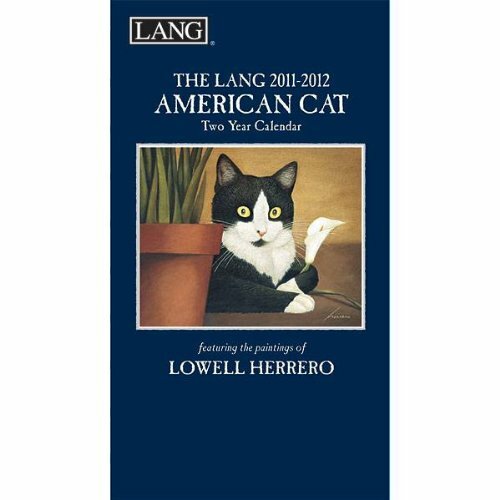 Planning ahead is easy with a Lang Two Year Calendar. You will love the added value of a Two Year Calendar for the price of one! This month-at-a-glace format fits neatly in a shirt pocket, purse or breifcase and includes the benefit of extended use! Includes a pen to help you keep track of your busy schedule! About the Artist: Lowell Herrero's passion for life is reflected in his captivating illustrations of the beloved American cat. Painting in layers of rich color and exquisite detail, Herrero portrays his feline subjects in their domestic surroundings with a sense of exaggerated realism for added fun. Herrero makes his home in California where he enjoys painting in his sun-filled art studio. Size Closed: 3.5" W x 6.375" H. Size Opened: 7" W x 6.375" H. ISBN-13: 9780741234513. ISBN-10: 0741234513.